Updated as at July, 2011: Read this carefully (print it, even), as the whole Mongolian visa registration/extension process can be a bit of an ordeal. You will need: passport, passport-sized photo, cash (NB: Americans pay nothing to register to stay up to 90 days), a photocopy of your passport photo page and of your Mongolian visa page (you can get this at the Mongolian immigration office if you need to), and a fair bit of patience. Some people have Mongolians write letters of invitation (or they write their own) but this wasn't required of me on a tourist visa when i did this recently. Don't head to the Mongolia Immigration office late afternoon, as at busy periods it can take a few hours to process Mongolian visas and you may have to come back the next day. The Mongolia Immigation office (Office for Immigration, Naturalisation and Foreign Citizens [OINFC]) is now located out of town, near Chinggis Khan International Airport. 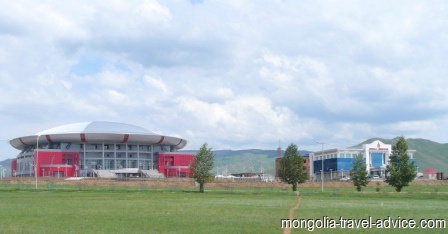 As of about 2009, it moved from the location in south-central Ulaanbaatar, which was formerly opposite the NIC petrol station near the peace and friendship bridge (your guidebook might still list the old Mongolian immigration office location; ignore it). Heading southeast just before you reach the airport, you will pass through a big white concrete arch/gate which spans over the road, and ahead on the left will be the big shiny new dome/yurt-shaped Ulan Bator stadium. It is impossible to miss. The Immigation Office is located adjacent to the stadium, on its far side. Just take a left down the road that heads behind the stadium. The immigration office from a remote distance: a view you will have if you fail to get off at the correct bus stop. You can take a taxi (if the driver doesn't speak English, you can say 'chinggis khan' and make foolish airplane gestures, he'll get the picture). Or, it's pretty easy to reach the Mongolia Immigration office by public bus, which is T300 (20 US cents or so). The number 11 bus leaves from the stop opposite the Mongolian Library. The library lies on Chingis Orgon Road. This is the road which runs down the West side of Suhkbaatar Square, with the library about 200m south of the square. You can also take the number 22 bus to Ulaanbaatar airport. To catch the number 22, walk north up the road which runs along the east side of the State Department Store (i.e. this road intersects Peace Avenue). After 400m the road will end at a 'T' intersection outside a big Movie Theatre complex. In front of the Movie theatre complex is a bus stop for buses heading west; take the 22 from there. Whether traveling by taxi or bus, keep a look-out for the stadium and the big white gate once you are out of town and in the ger/yurt district. Get off the bus at the stop just after the stadium. Brace yourself; you're about to experience some old- fashioned Mongolian bureaucracy. If you're there in summer (peak tourist season) the Mongolian Immigration office will be very chaotic. Don't expect any officials to approach you to offer assistance, or to have taken the logical step of posting instructions for tourists; you will need to have some initiative and not be afraid to ask questions of officials and other travelers. Also, when lining up, stand close to the people in front of you and take up some room in order to stop locals pushing past you -which seems to happen here. Walk in the main office, turn right. Take a number from the ticket machines and head right to the welcome desk. Ask for a visa registration form (you can also extend your visa with this form), which costs about T1,000 (50 cents or so). This desk can also photocopy your passport if you don't have a copy already. Fill out the form; there should be a glue stick around to affix the photo. As you walk in the left of the room, there is a schedule of fees for extending visas (for those countries who have to pay [i.e. Americans don't]); as at July 2011 it cost T27,500 (US $20 ) for the first week, then T3,000 (a bit over US $2) for each day after that. If paying, take your visa form out of the room and head to the bank in the opposite side of the building. Go to the cashier and say, "extend, 13 days, please" etc; pay the fee and get your receipt form. Now, you are finally ready to see the Mongolia Immigration form processing people. Now I'm not usually one to advocate 'jumping the line' and disregarding a ticket numbering system, but when I was there there were long lines of Mongolians who were obviously doing so, and still being happily served by the officials. Because of this lack of procedure, it was apparent I'd be waiting for about 5 hours if I waited for my ticket number to be called up, so I just lined up at a counter like everybody else and was served. Mongolian visa extension processing time: It was a busy period and I needed to wait 1 hour for my extension to be processed; registrations (only) are immediate. 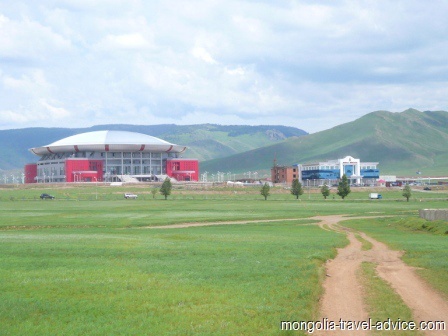 Changes to Mongolian visa type: There is conflicting information on this; when researching this with my local embassy outside Mongolia; it was made clear to me that I could not change a Mongolian visa type (e.g. change tourist visa to business visa) while in Mongolia (i.e. you would have to exit to the China/ Russia, get a new visa, then return). However, the pricing board at the Mongolia Immigration office clearly listed fees for visa type changes, so it may be possible. My advice: it's worth going to the office to give it a try if you need to, but there is a risk they might not allow visa type changes, so if you can organize the correct visa type beforehand then you definitely should. If this all sounds too much like hard work, then the good guesthouses offer a visa processing service for tourists (for a fee, of course). You may have to join them in person at Mongolia immigration, but at least they'll drive you there and will be able to work through the bureacracy faster than a tourist can.